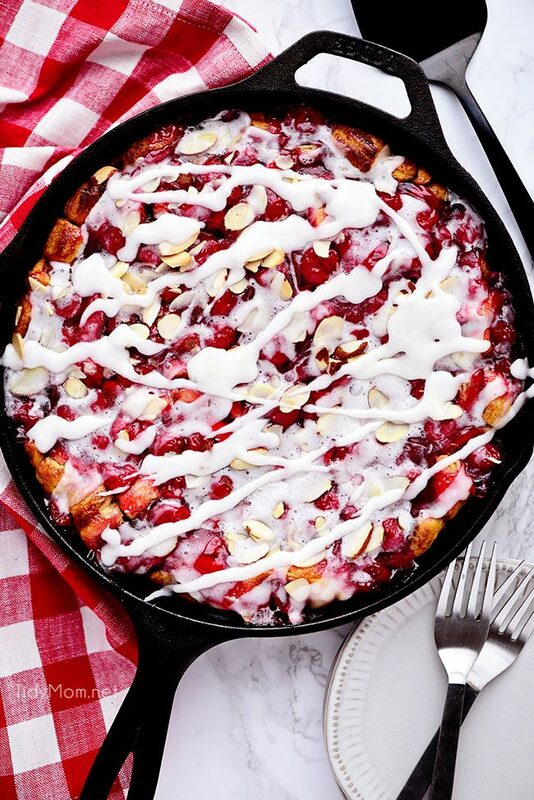 The smell of Cherry Coffee Cake baking will have everyone out of bed in no time. A can of pie filling and a few tubes of cinnamon rolls help make this delicious breakfast or dessert. It’s the perfect addition to a hot cup of coffee and good conversation. I can’t get enough of cherry lately which means I might have to break out some of my other favorite cherry recipes like Chocolate Cherry Cheesecake Parfaits, Brownie Cherry Cheesecake, and my all-time favorite Cran-Cherry Whiskey Sour. Being an adult pretty much just means you can now eat dessert for breakfast without anyone telling you that you can’t! I’ll admit, I’m a huge sucker for a good coffee cake. I mean what’s not to love about starting your morning with an incredible sweet treat? 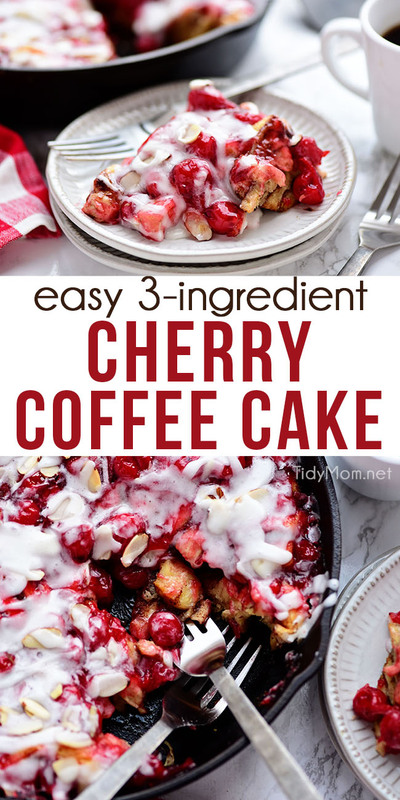 This Cherry Coffee Cake took everything I thought I knew about breakfast cakes and blew it out of the water. 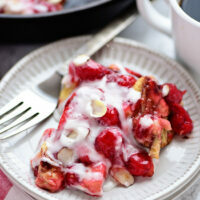 It’s a total dream dessert and it will be hard to find anyone who won’t love it! Coffee cake is one of my all time favorites and the first dessert I always choose. 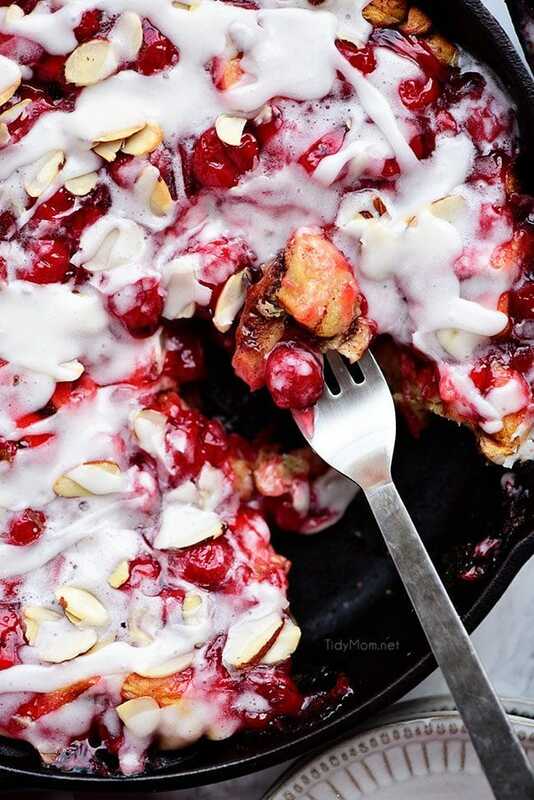 There’s something so magical about soft gooey cinnamon rolls topped with a sweet cherry pie filling, and slathered in a rich cream cheese icing. Let me be clear right now before anyone makes any assumptions. Coffee cake does not mean it has coffee in it! I’ll say it one more time for the people in the back. Coffee Cake DOES NOT include coffee in the ingredients! Coffee cake originated in Europe when the Danish came up with the earliest versions of coffee cake. In the early 17th century it became the custom to enjoy a delicious sweet and yeasty type of bread when drinking coffee beverages. This is how the dish got its name because it was a cake you eat while drinking coffee. Don’t worry though, if you aren’t a coffee fan you are still welcome at the coffee cake party. Eat the cake with whatever you like, because there is never a wrong time for cake right? To makes things even better, it can be served as breakfast or dessert or both if you’re having one of those days (no judgment, we’ve all been there). It’s the pure beauty of coffee cake, and isn’t it great! Remember when I said how easy this recipe is to make? Well, it wasn’t an exaggeration. It is seriously one of the most simple, yet delicious recipes I’ve ever made, and here’s how it’s made. Heat oven and grease a 10-inch cast iron skillet, or round pan with butter. Then remove refrigerated cinnamon rolls from the tube and set icing packet aside. Separate the dough and cut into pieces. Place cinnamon roll pieces in buttered pan. Spoon pie filling over the dough and sprinkle with almonds. Next, you’ll bake until deep golden brown and let cool 5 minutes, then drizzle with icing. Lastly, just cut your slices, serve warm and enjoy! Coffee Cake Recipe Tips You Won’t Want To Miss! Use a skillet or an 8- 9-inch pan: Don’t have a cast iron skillet laying around? That’s totally fine! You can use an 8 or 9-inch round cake pan. With one of these two sizes, you will you will still only need one can of cinnamon rolls and about 1 cup of pie filling. Make your own icing or use store bought: You can use the icing that comes with the cinnamon rolls, or you can make your own like I did. Making your own allows for a thicker icing layer on tops, because hello, you can never have too much icing, right?! You can find the homemade icing recipe at the bottom of the post in the recipe card! Cool for 3-5 minutes after removing from the oven. Place a wire rack upside down over cast iron skillet or cake pan; turn rack and pan over. Remove skillet/pan and place a large plate upside down over the coffee cake and turn over and drizzle with icing. How should I store coffee cake? This coffee cake can be left out on the counter, just covered with foil or plastic wrap to keep it fresh. You can also store it in the refrigerator the same way. Or you could slice it up and store the pieces in an airtight container. The coffee cake will keep for a few days covered and on the counter or refrigerator. It can also be re-heated one serving at a time in the microwave. 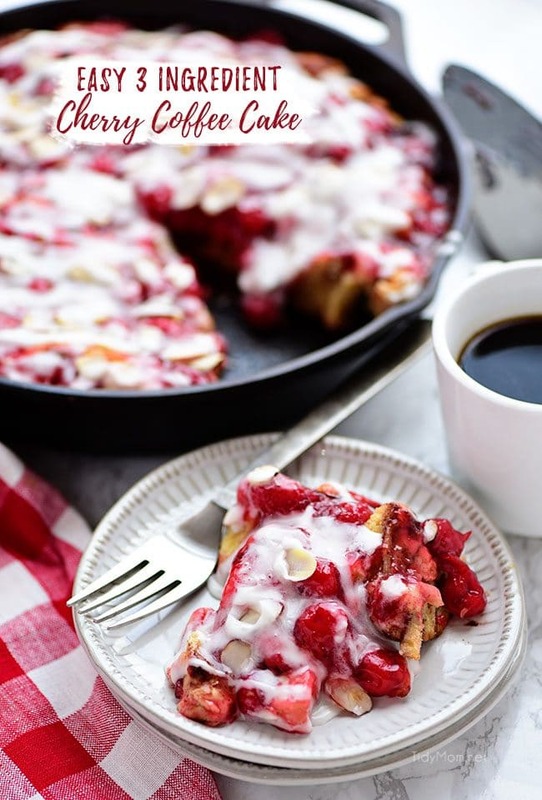 Lemon Raspberry Coffee Cake If you like cake for breakfast, this is going to be your favorite coffee cake recipe ever… This breakfast cake is tender with a bright tartness that will make your lips pucker just a bit……when suddenly it’s bursting with sweet raspberries. Tiramisu Baked French Toast Casserole A French Toast Bake with panache! Decadent layers of coffee and cream with a chocolate almond crumble top! The Best Homemade Blueberry Pancakes Don’t miss these easy to whip up, soft and fluffy pancakes. Filled with fresh berries and bursting with flavor they’re always a hit! Chunky Monkey Baked Oatmeal Cups Full of whole grain oats, chocolate chips, banana, and walnuts. They pack protein from the eggs and are SO easy to make. You can either let them sit overnight or bake right away. 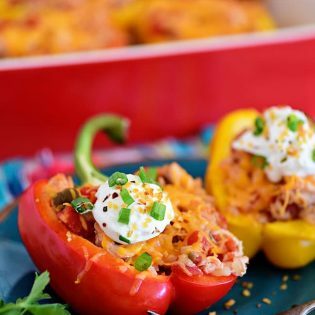 Perfect for meal prep breakfasts, as they are great to make ahead and also freezer friendly. Baked Maple & Cinnamon Donuts Forget the doughnut shop -if you have a donut pan, you can have homemade donuts at home any day! This recipe is full of maple flavor, topped with cinnamon and sugar and can be on your table in 20 minutes. Baked Berry Mascarpone Stuffed French Toast This recipe is packed full of fresh berries, and mascarpone cheese for a decadent and delightfully sweet breakfast treat! Make it any time of year–it’s delicious for any season! Like This Cherry Coffee Cake Recipe? Pin It! 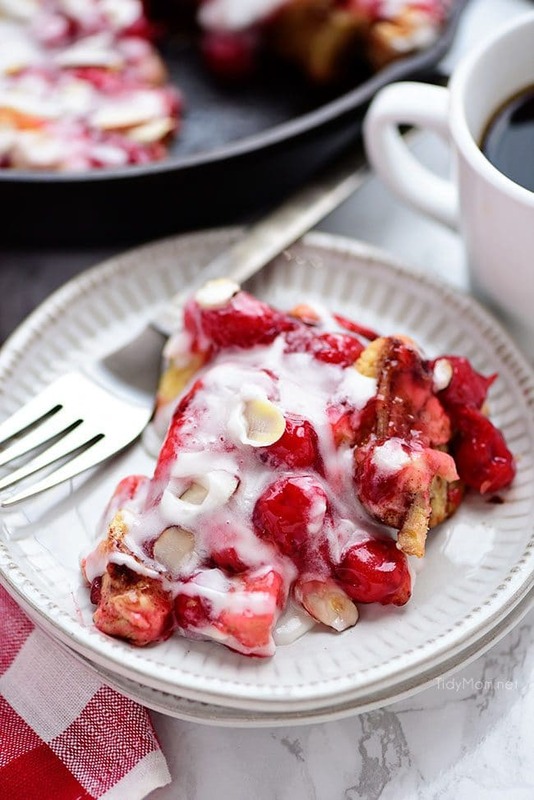 You’re Going to Fall In Love With This Cherry Coffee Cake! You might have already fallen in love with this coffee cake, by just reading the recipe, but wait until you actually try it! It will be love at first bite! I can’t wait to hear how much you love the recipe. Once you try it for yourself, make sure to leave a comment below and tell me your thoughts! 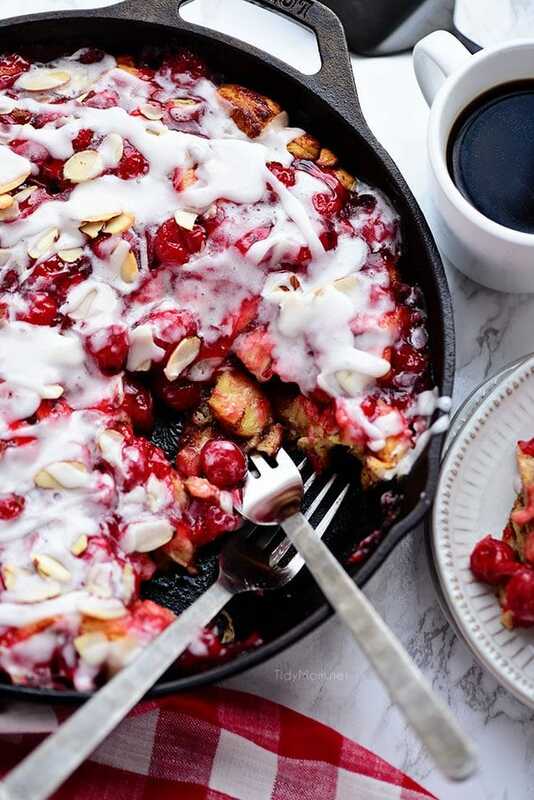 The smell of Cherry Coffee Cake baking will have everyone out of bed in no time. 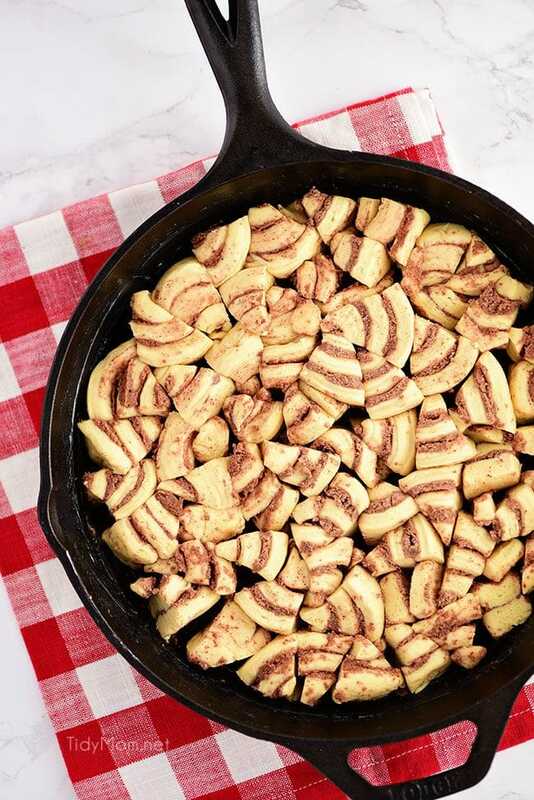 Pie filling and cinnamon rolls help make this delicious breakfast. Heat oven to 375* F and grease a 10-inch cast iron skillet* with butter. Remove cinnamon rolls from tube and set icing packet aside (if you'd like to make your own icing, see directions below). Separate dough and cut into 4-6 pieces. Place cinnamon roll pieces in buttered pan. Spoon pie filling over dough and sprinkle with almonds. Bake for 30-35 minutes or until deep golden brown. Let coffee cake cool 5 minutes, then drizzle with icing. Cut into wedges and serve warm. In a small bowl, stir together the cream cheese and powdered sugar until completely combined, then stir in the extract and milk. Add more milk if too thick or more sugar if too runny. You can use a 8 or 9-inch round cake pan. You will probably only need one can of cinnamon rolls and 1 cup of pie filling. To remove the whole cake from the pan or skillet: Cool for 3-5 minutes after removing from the oven. Place a wire rack upside down over cast iron skillet or cake pan; turn rack and pan over. Remove skillet/pan and place a large plate upside down over the coffee cake and turn over and drizzle with icing. The coffee cake will keep for a few days covered and on the counter or refrigerator. Can be re-heated one serving at a time in the microwave. This coffee cake was amazing! Definitely going to make this one again. You’ve won me over with this cake. Seriously so delicious. Super delicious! My son is obsessed with this stuff! I’m over here drooling! Just delicious! 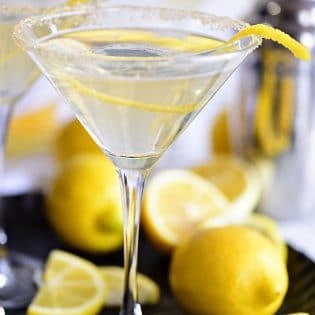 Loving that there is just 3 ingredients and how simple this is to make.